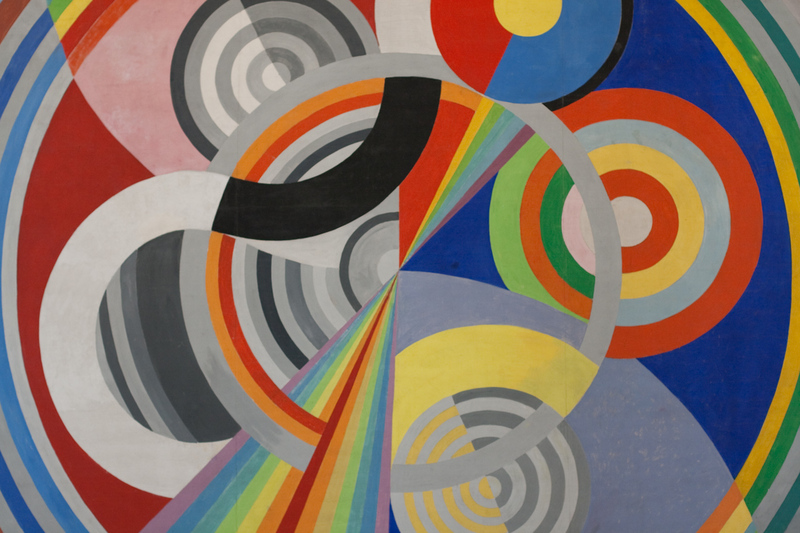 Robert Delaunay, Rythme no 1 (1938), oil on canvas, Musée d'Art Moderne de la ville de Paris. WikiArt. So far, we have seen that metaphor, metonymy, and synecdoche are relatively unusual in Western representational paintings prior to the twentieth century, but that symbols are much more common. Other than those in movies or advertising, most of the examples of visual tropes cited in the literature are of modernist twentieth century works, so my next task is to consider whether they differ in this respect. Unfortunately I am limited in the works that I can show here, because of copyright, so I am afraid that in some cases I must offer you links rather than local images. Littlemore’s recent review of the use of metonymy in art (pp 111-113) covers key studies published by Jakobson, Green, Friedman, and Ryland, much of which I have already examined in previous articles in this series. 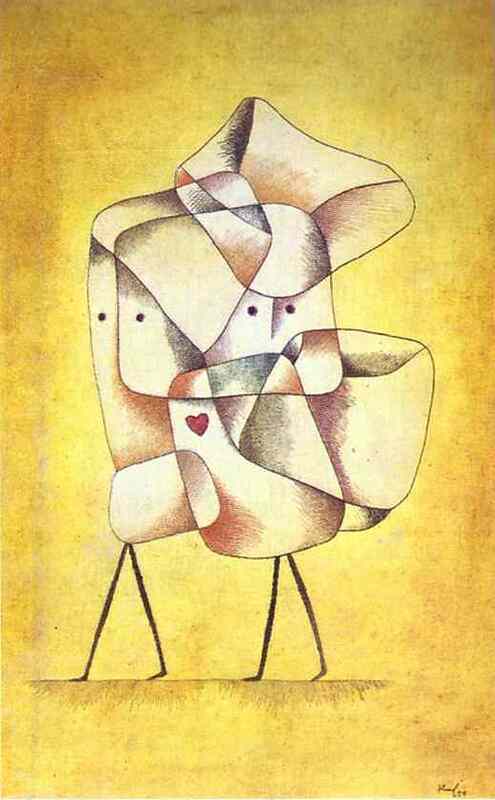 Paul Klee, Siblings (1930), oil on canvas, Private collection. WikiArt. Among the more modern works cited in those sources which claim that metonymy is important and common in paintings, are those of Cubism and its derivative movement Orphism, Colour Field paintings such as those by Barnett Newman and Mark Rothko, and of course the Action Paintings of Jackson Pollock; for many people, the latter works epitomise painting in the middle of the twentieth century. The structuralist linguist Roman Jakobson made the bold claim that Cubism was metonymic, and Surrealism was metaphoric. This is on the basis that Cubism apparently focuses on what is not in the painting – an assertion which seems novel and paradoxical – by showing ‘the opposite’ of what was there. Surrealist art, in contrast, is claimed to make comparisons between everyday objects in terms of metaphors. Applying the criteria from previous articles in this series to a range of Cubist and Surrealist paintings, I am afraid that I cannot see any evidence for the extensive use of metonyms in Cubism, and the tropes most frequently encountered in Surrealist paintings appear to be symbols (often in complex combination and manipulation). You can judge for yourself, perhaps through the Wikipedia articles on Cubism, Orphism, and Surrealism. Ryland cites but does not analyse works of Abstract Expressionism and its sub-movements such as Colour Field and Action Painting. Hugely diverse in appearance, it is hard to develop any consensus but I have been unable to discover any movement or sub-movement which appears to use metaphor at all, and very infrequent evidence of the use of metonymy or synecdoche. Whether the content of the painted image is sparse as in Colour Field, or rich and dense as in Action Painting, most works lack recognisable objects, which makes direct use of visual tropes impossible. 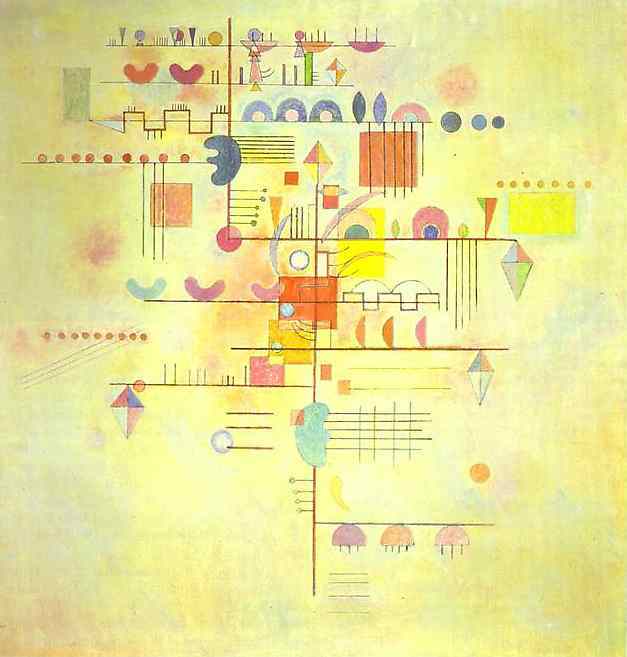 Wassily Kandinsky, Gentle Accent (1934), oil on canvas, 80 x 80 cm, Solomon R Guggenheim Museum, New York. WikiArt. This is common to most abstract art: because these tropes are heavily reliant on the viewer recognising objects or concepts in the painting, works which lack identifiable objects, or which leave open several possibilities as to what objects are, struggle to use the tropes. The more recognisable image content is, as in photographs, advertising, and graphic design, the greater the potential use of rhetorical tropes. Thus, far from using visual rhetoric more extensively or powerfully, much of twentieth century art has become less able to use it. Where works have more closely resembled graphic design, as in the Pop Art of Roy Lichtenstein or Andy Warhol, so they have used metaphor and metonymy more. Strangely this is not noted by Littlemore or Ryland. Littlemore and others, keen to make the point that cognitive processes underlying metonymy extend beyond language alone, fail to give adequate weight to reasons for these tropes being so pervasive and common in language. Language consists of a limited number of word tokens to cover an infinite variety of meanings, so uses tricks to extend vocabulary and add nuance. Those tricks include tropes such as metaphor, metonymy, and synecdoche. Language uses symbols too, but they are only part of the wide range of tricks. So if you want to talk about depression, you can refer to it literally, or use figurative terms such as ‘feeling down’, ‘the blues’, and so on. In painting a single object or concept, there is an infinite number of ways that you can represent it. If you want to paint just a colour field and represent depression, then you can be symbolic and opt for blue. If you are working representationally, then you can portray one or more individuals who appear depressed, or a blue room with dark wet weather outside, or any of a host of other views. Some may use symbols, in which a single object evokes meaning beyond the confines of the canvas, but there is no need for indirect reference by way of rhetorical tropes like metaphor, metonymy, or synecdoche. Visual tropes come into their own when you are restricted in what you can depict, as in advertising, and most particularly adverts which are regulated, such as those for tobacco products in many countries. Advertising has a predilection for metaphor and other tropes because it has a much simpler message to put across, but the use of more direct means of expression common in painting would be less effective, openly dishonest, or too transparent. I started this series as an open enquiry, having been enthused about metonymy in visual art by Littlemore’s book. The evidence that I have seen shows that, when you constrain the concepts of these rhetorical tropes in the way that you must in language, they are uncommon in painting. However symbols are more commonly used in paintings. I therefore think that it would be wishful thinking to state that metonymy, metaphor, or synecdoche are universal tropes, in both verbal and visual media. There are good reasons why they are predominantly verbal, and good reasons why they are not used as much in paintings. In this sense, I fear that the exciting generalisations of Jakobson, Bal, Ryland, Littlemore, and others are unfounded and exaggerated. The rhetoric/semiotics of paintings is different to that of language. Littlemore J (2015) Metonymy. Hidden Shortcuts in Language, Thought and Communication, Cambridge UP. ISBN 978 1 107 04362 6. Posted in Language, Painting and tagged abstract expressionism, advertising, allegory, colour field, Cubism, languages, metaphor, metonymy, painting, pop art, rhetoric, symbol, synecdoche, trope. Bookmark the permalink.